On Sunday, David and I were walking around LES, when out of the blue, he suggested we go to the Brooklyn Bridge Park (technically the Empire-Fulton Ferry State Park) in DUMBO rather than Tompkins or Washington Square Park, like we normally do on Sundays. The previous week the grass was pretty dismal and sparse at Washington Square, so we hopped on the F train and made our way to DUMBO, looking for greener pastures. Not to be corny, but once in Brooklyn, we discovered that yes, the grass was greener on the other side! Unlike Washington Square Park, we didn’t have to walk around looking for a small patch of green. All we had to do was plop ourselves down. For a while, we sat there quietly enjoying the view of Manhattan and the NYC waterfalls as the warm grass tickled our bare feet, but then David felt a rumbling in his stomach and wanted something sweet. Last year, when we were in DUMBO, we had a mango and passion fruit sorbet topped with chewy macaron cookies at Almondine. 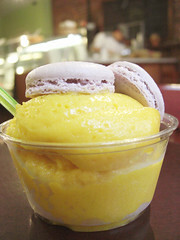 Macaron cookies on top of sorbet, doesn’t that sound deliciously luxurious? If not, trust me, it was. Since we’d already been to Almondine though, I wanted to go across the street to Jacques Torres this time to try their macarons. Because even though Almondine is owned by Jacques Torres, it’s possible the macarons from the two bakeries could taste completely different for some strange unforeseen reason (different oven, different pastry chef, different water, different levels of moisture in the air, etc.). Unfortunately, Jacques Torres didn’t have any macarons that day so we couldn’t make a comparison. Undefeated, we made do with some other sweets. 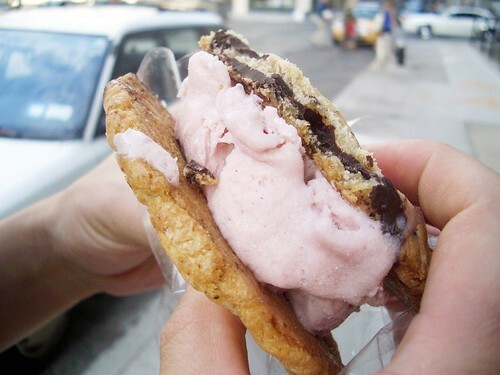 David got an ice cream sandwich made with strawberry ice cream and chocolate chip cookies. The cookies were soft and had lots of chocolate chips, but I think the ice cream sandwich was preassembled and frozen for too long. There was a slight freezer taste I wasn’t crazy about. Nevertheless, David thought it was OK and finished it in a few minutes on the way back to the park. At the park, we moved onto an almond croissant. 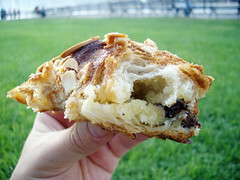 The croissant was crisp on the outside, the way I like it, and filled with almond paste and dark chocolate. I liked it enough, but it was a bit too heavy for me. I like croissants that are buttery and light as air. This was heavy and felt like a buttery brick in my stomach. 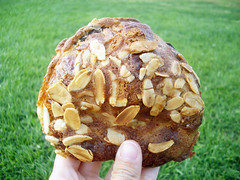 However, I do give props to Jacques Torres for making real almond croissants filled with almond paste. I hate how other places just sprinkle some almond slivers on top of a croissant and call it an almond croissant. Let me tell you, it’s not. It’s like, I can spray myself with Glow by JLo, but at the end of the day I won’t be JLo. Just try it, I’m sorry to tell you, you’ll end up with the same results. 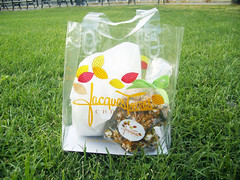 My favorite sweet from Jacques Torres was caramel popcorn drizzled with dark chocolate. 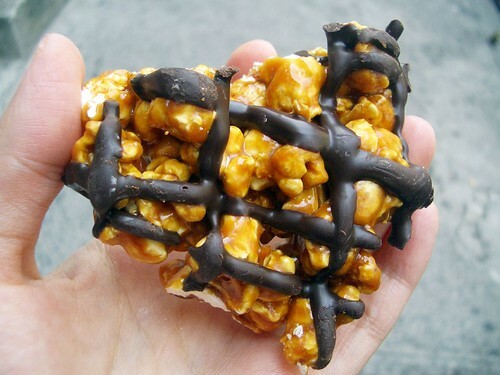 The caramel popcorn was crunchy, and the dark chocolate drizzle gave the popcorn a strangely savory taste it needed without the addition of any nuts. I didn’t know chocolate could taste savory! I loved it. We finished the bag last night, and the last bite made me a little sad that we were caramel popcorn-less, but let me digress…. 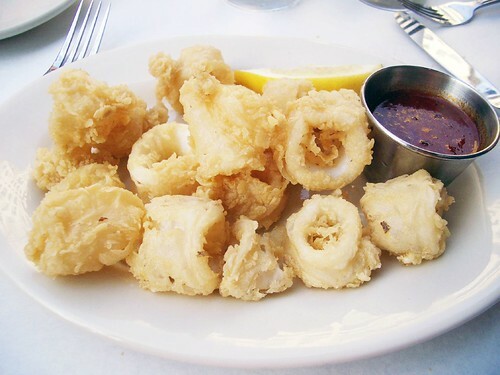 After our sweets at the park, David then proclaimed he wanted something salty, and wanted to go eat the fried calamari we had seen people eating at Water Street on the way to Jacques Torres. Oddly, I wasn’t hungry that day (this may have something to do with the numerous shots of soju I had the night before), and I tried to dissuade him. But, David kept insisting, and considering he never wants to eat anything but junk food, I felt I shouldn’t discourage him when he has an urge to eat. We started off at Water Street Restaurant & Lounge with some hot rolls. They were crispy on the outside and soft and hot on the inside. Good stuff. 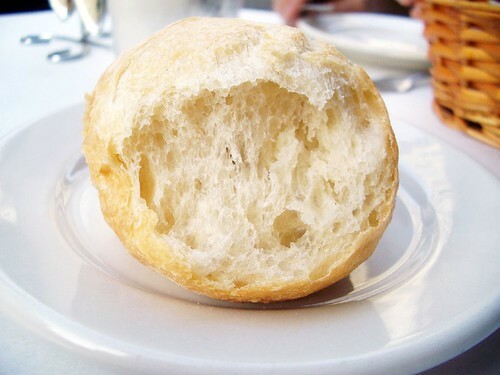 I notice, for the most part, you can tell if a restaurant will be good by their bread. If I see stale bread from the previous service, or worse, the night before, call the police, I don’t care, I’m outta there. I got the Avocado Salad with Grape Tomatoes, Corn, and Black Beans. At first glance, it looked gorgeous, but then I looked more carefully and I was a tad disappointed. The avocados weren’t slices and more of a discolored mash. As for the greens, I was annoyed that the greens weren’t all fresh. This is a pet peeve of mine. Please don’t serve me a salad with green gunk on some of the leaves. Is it dark in the kitchen? The green gunk was right there on two places on the side of the plate. Surprisingly, this happens quite often at restaurants. 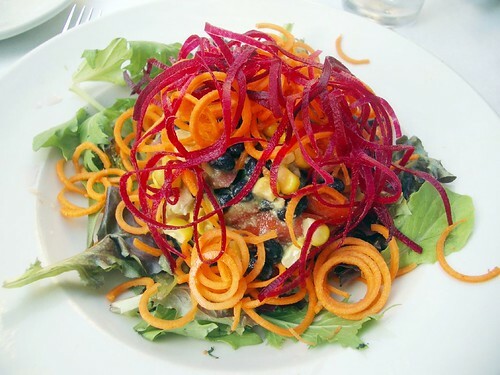 It seems many restaurants don’t put as much care into a salad, just because it isn’t cooked. If anything, salads should require more care since it’s eaten raw, and no heat is applied that could possibly kills germs and bacteria. That’s just my opinion. Fortunately, the Fried Calamari with Marinara Sauce was really good. The flour batter was nice and simple, and the calamari was fresh and gently fried so the squid was chewy yet still soft. Some places, the squid is so overcooked the calamari taste like little undigestible tires of rubber. Not the case at Waters Street. We approved. 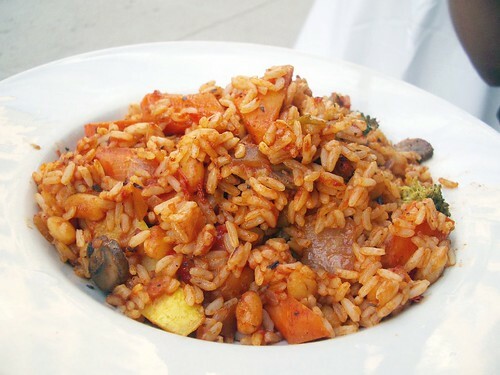 After the calamari, we both shared the Vegetarian Jambalaya with Sauteed Seasonal Vegetables in a Spicy Creole Tomato Sauce. Overall the dish was average. Nothing too exciting. Seasonal vegetables were squash, carrots, and white mushrooms. David thought the yellow squash tasted like tap water, which I understood when I took a bite; it was a bit watery. I think the squash may have been either boiled in water before they were sauteed or were partly frozen. In any case, if you ever go to Water Street, skip the salad and jambalaya, and get two orders of fried calamari along with some hot rolls while enjoying the view of the Empire Stores across the street. 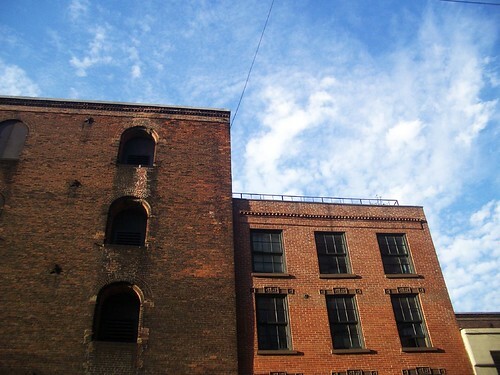 The Empire Stores, according to Wikipedia, is “a former dry goods storage warehouse from 1880, mostly unused.” I understand the building will be undergo “revitalization,” which sounds like Avalon or Avalon-like buildings will be coming into DUMBO. Whatever the case, I hope the beauty of the building isn’t lost; I find the Empire Stores glorious in a ghostly manner. So our little jaunt into DUMBO was a mix of good and bad, which is to be expected, but isn’t that what makes adventures so fun; the mystery of the unknown? This weekend is the Dumbo Art Under the Bridge Festival which I’m going to try to make. If so, I’ll report back on any new tasty delectables I may find in DUMBO along the way. If not, go yourself, and let me know what you discover on your own adventure. Wherever you are coming from, the grass could be greener…, or not.